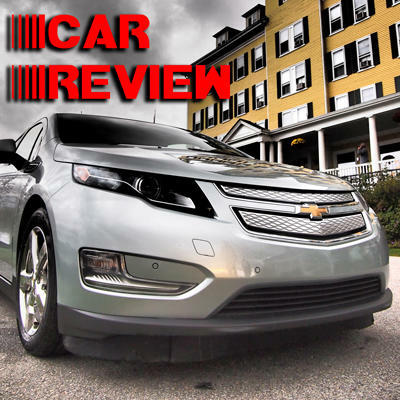 2012 Chevy Volt review: Is This the Future? Electric vehicle technology is nothing new. The earliest carriage manufacturers began toiling with battery-powered cars around the 1830s and in 1899 the Belgium-built "La Jamais Contente" set the land speed world record at 66MPH. But two years prior to that in 1897, the first commercial fleet of EV vehicles were represented as New York City taxis. Back then, drivers had three different engine types to choose from—steam, combustion or electric—and it just so happened that electric was the most popular because of the ease in gear changing and lack of vibration. Also, steam engines could take up to 45 minutes to start in cold weather. The average electric vehicle in the early 1900's had a 20-25MPH top speed and a 20-30 mile range, though some models like Mrs. Henry Ford's 1914 Detroit Electric could run for 80 miles before needing a charge. Base model electric vehicles were priced at around $1,000 in the early 1900's, which translates to about $23,000 today. Fully loaded electric cars cost up to $3,000, which was a bit of a splurge at almost $70,000 today. Within recent years, electric vehicles have begun to migrate back into the spotlight after a long hibernation that was incited by a man named Mr. Henry Ford and his highly affordable combustion engine vehicles. The Chevy Volt is one of the first American-made electric cars to make its way onto the consumer radar in quite some time. 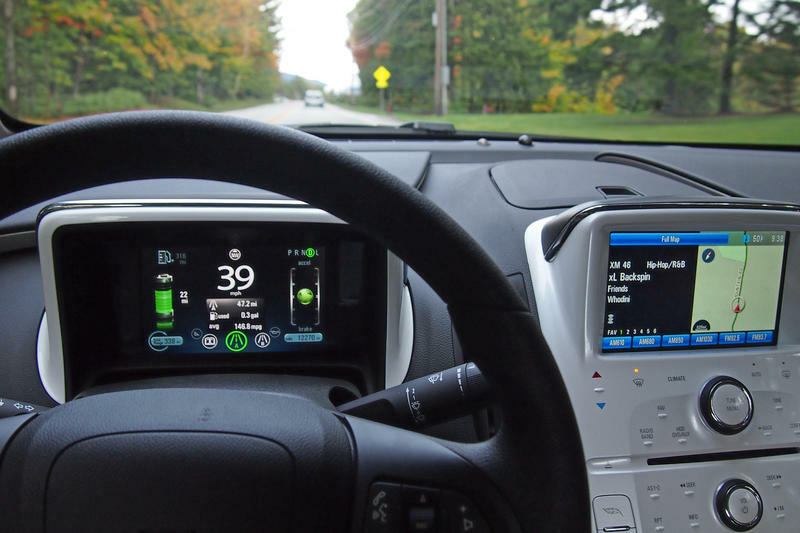 While the Toyota Prius hybrid has been dominating the Eco market with the Honda Civic hybrid riding its coattails, the Chevy Volt is approaching things in a slightly different way technologically. 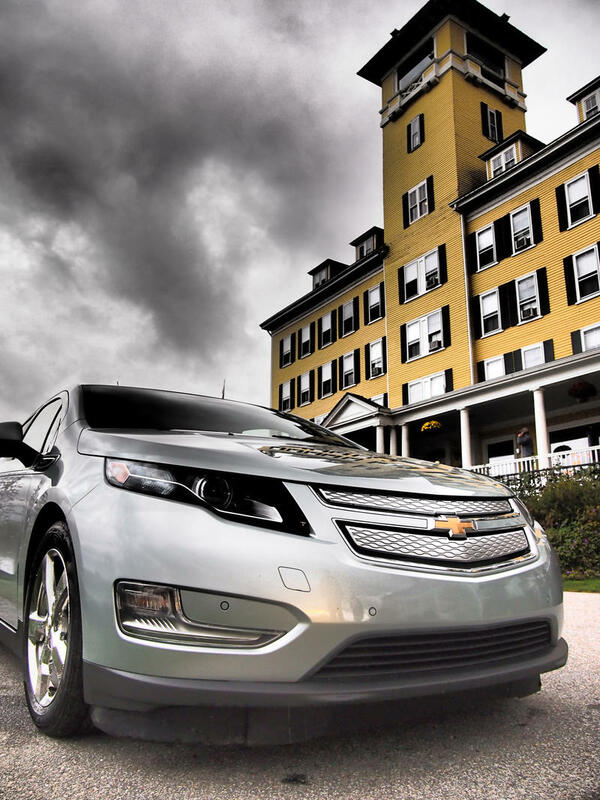 We're going to talk about that in this review, but first I'd like to thank GM for the opportunity to drive the Volt for three days on a Fall Colors tour from Burlington, Vermont to Bar Harbor, Maine. I was able to record hundreds of miles on a 2011 model in all shades of weather, not to mention going canopy zip lining and visiting the world's longest candy counter along the way. This was all courtesy of Volt Spokesman Rob Peterson and the fearsome event-planning duo Lisa Calvi and Gary Sowerby. You guys rule! 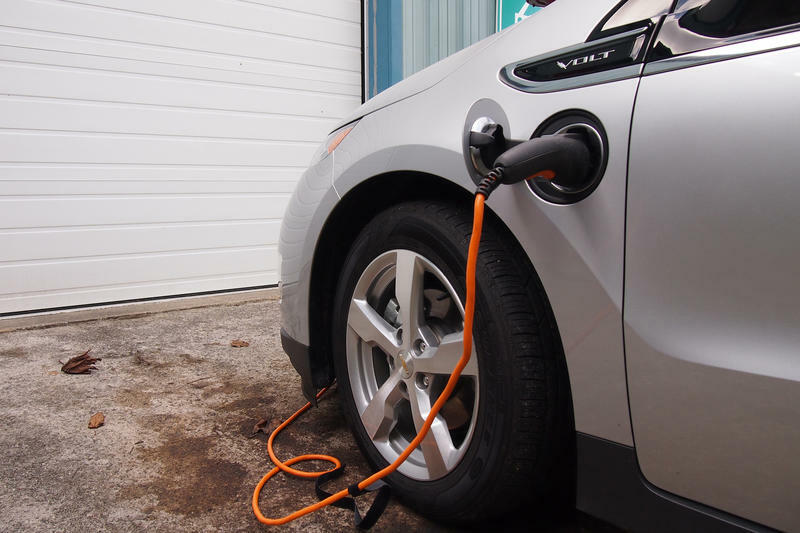 The Chevy Volt is equipped with a 16kWh lithium ion battery that has 288 cells. The jumbo juice box features a six-foot long t-shaped design that runs underneath the car. GM designed the battery so that it always has a reserve of power and is temperature controlled with a liquid climate system. GM also backs the battery by an 8 year/100,000 mile warranty, and the Volt comes with a charging device for 120V circuits. At 120V, it takes 10 hours to fully charge the Volt, but if you use a 240V circuit, (like a home dryer) it takes a mere 4 hours. 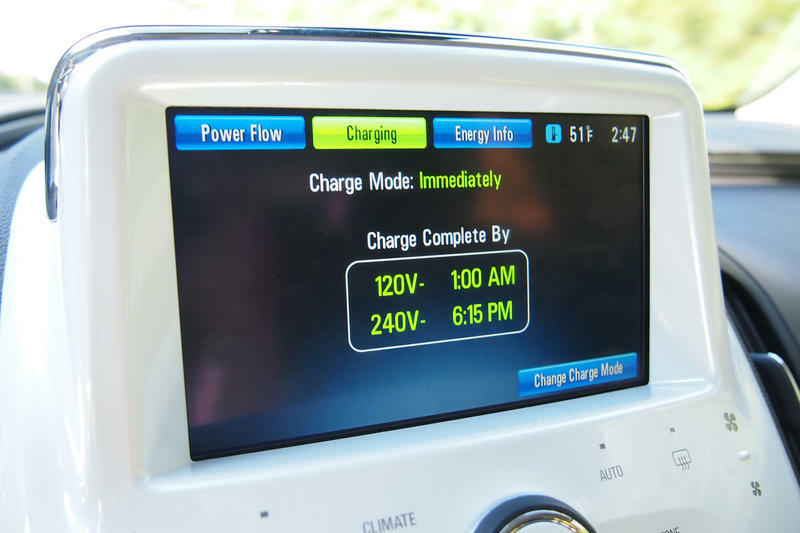 If you're concerned about tripping breakers, the Volt's charger has a reduced level that draws less power but requires more time to charge. There's also a cord theft alert—if the cord is unplugged while charging, the car's alarm system will fire off. Using the Onstar application for most smartphones, Volt drivers can schedule charging during off-peak hours to avoid breaker tripping, keep track of electric range and battery stamina, get plugin reminders, and lock and unlock the doors. 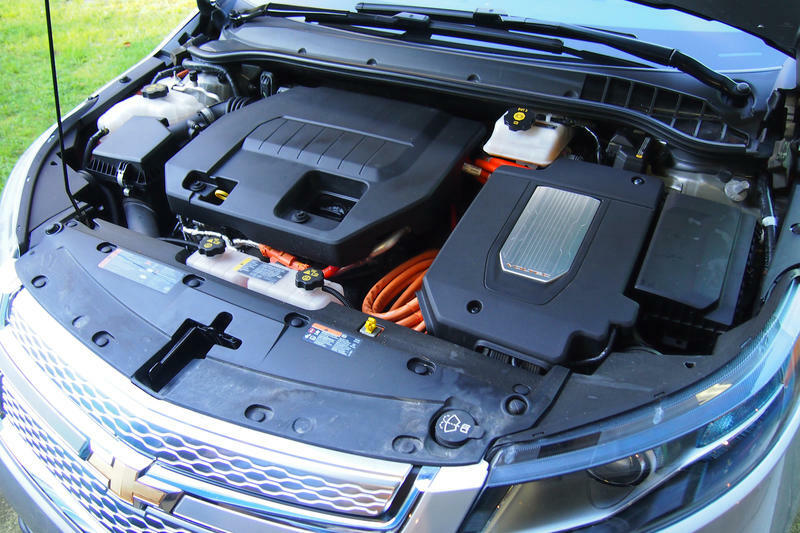 This giant lithium ion battery will give the Chevy Volt an estimated 40 miles per charge. After the battery is depleted, the car will employ the 1.4L gas engine to power the electric drivetrain. The gas engine requires Premium grade petrol and averages 35-40MPG. So, when you take into account the 40 miles on the battery in conjunction with the MPG average on the gas engine, the Chevy Volt is netting you approximately 50 miles to the gallon, which is right around Prius territory. But that's if you're taking long trips. If you commute around 30 miles to work each way and have access to a charging station near your office, then you're paying next to nothing for transportation. 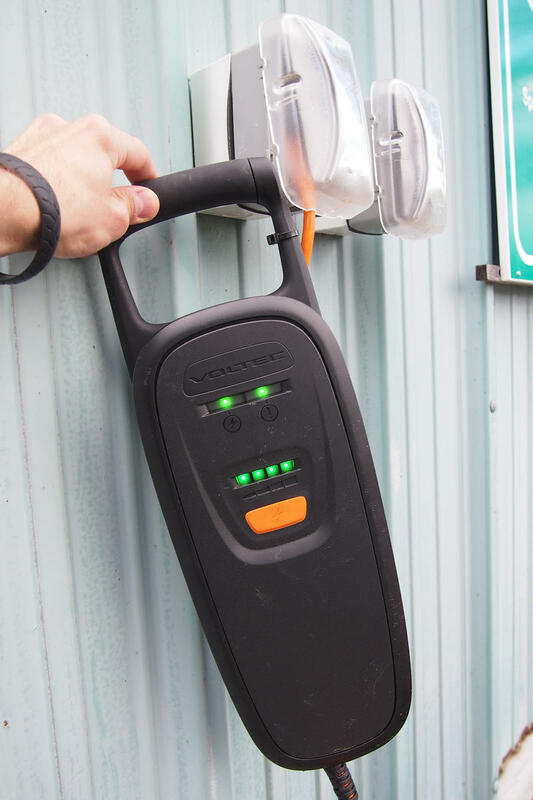 According to Rob Peterson, the Volt's gas tank is pressure-sealed in order to reduce evaporation due to oxygenation and condensation. This is especially important for drivers who rarely even use the range-extending engine. 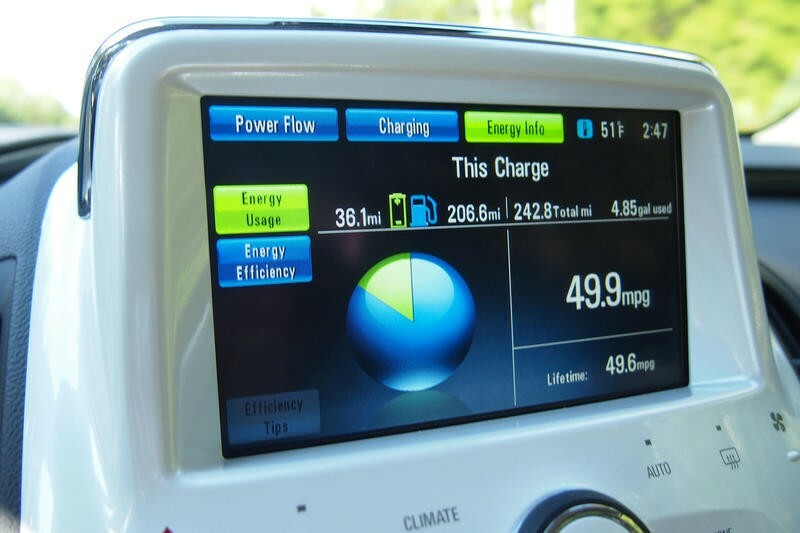 If gas has not been added or used, every six weeks the Chevy Volt will prompt drivers to enter maintenance mode, in which the car will run the 1.4L 83HP engine for about three minutes to cycle gas and oil through the cylinders. Let's take into consideration the Nissan Leaf, which has a larger 24kWh battery and outputs an approximate 73-mile range. Without a backup plan, Leaf drivers are unfortunate sufferers of range anxiety, and there have been reports of stranded Leaf drivers along various highways. Then there's the Prius, which is more comparable to the Volt in that it benefits from the supplemental combustion engine. However, the Prius is a bit of a different breed. It's a true hybrid. Toyota's hot seller relies on its nickel-metal-hydride batteries for speeds up to 15MPH, then the Power Split Device switches over to the gas engine. This way, there is a constant battery regenerative process transpiring while driving a Prius. For versatility's sake, the Prius will take you farther without having to charge, but the Volt is the better bet for short daily commutes or in-town errands. Now that we have the scientific nerdery out of the way, how did the Chevy Volt do on the road? Prior to the GM trip, I drove a Toyota Prius for about two weeks in order to compare the two whispering wheelers. While I loved the Prius's fuel efficiency monitoring system, I was not in love with the way the car handled. Excessive winds made the Prius feel like a tumbleweed across the road and power was significantly lacking. In order to maximize fuel efficiency, I had to nearly slow to a crawl going up hills, but the Volt was a different story. Yes, the Volt's handling was far superior to that of the Prius. On my first drive with the Volt, I looked down at the speedometer and realized I was going 89MPH on Rte. 89 in Vermont. But I couldn't even tell. The car is undeniably smooth, courtesy of its MacPherson struts and compound crank suspension. The car was also quiet, and I've never felt such an urge to drift a vehicle that was devoid of a V6 around a corner before. Rob told me that the Volt spent more time in GM's wind tunnel than any other car, including the Camaro, so that must have been the reason why. And as for power? 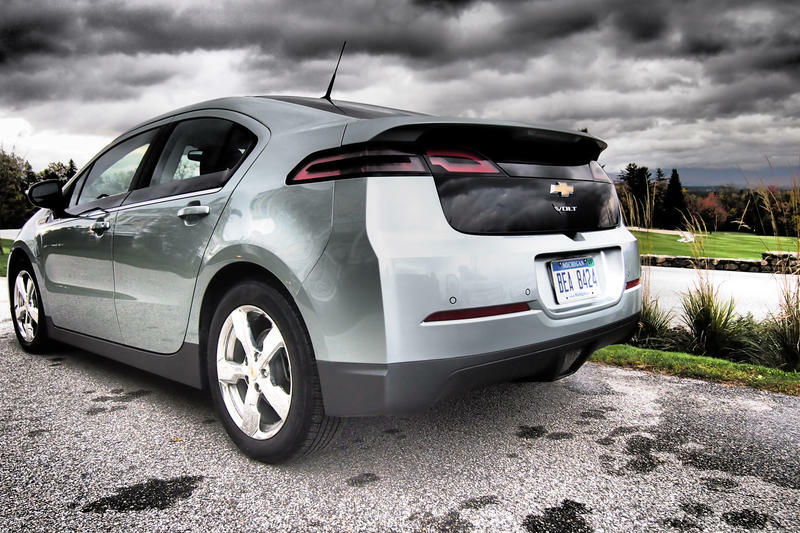 The Volt's 149-horse electric engine produced 273 lb.-ft. of torque. This was heightened when Rob had me switch into Sport mode, which mapped the throttle response to a significantly twitchier trigger. On a dragstrip, the Chevy Volt would eat the Prius for breakfast. Then there was Mountain mode. Say you're ascending a tall mountain, which places additional stress on the electric engine. 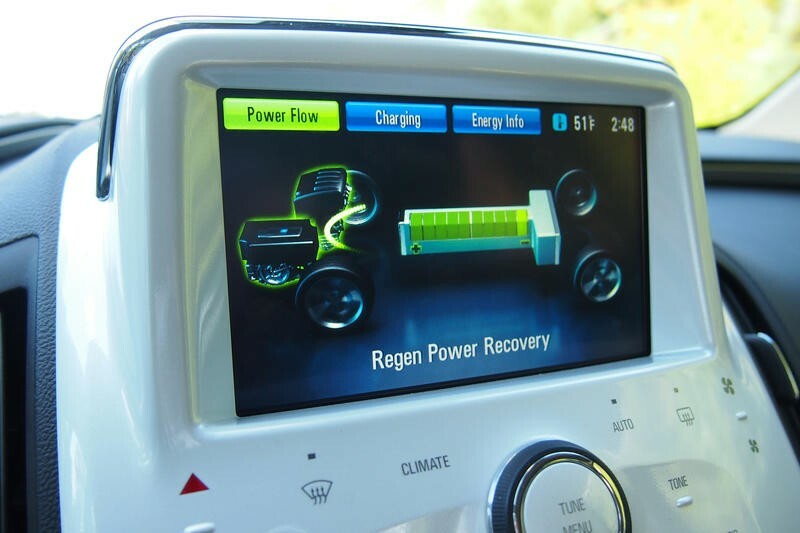 Mountain mode will switch over to the Volt's gas engine in order to slightly regenerate the battery while climbing. In fact, the Volt's 16kWh battery is not designed to handle steep grades like that of Mount Washington, so think of those rare times as ideal opportunities to cycle unused gasoline and restore a fraction of the battery. In order to keep tabs on how efficient you are as a driver, the Volt has an acceleration meter on the left hand LCD screen. If you pin the pedal to the floor, the happy spinning green circle will rise up, turning yellow. If you're too generous with brake application, the blissful revolving circle will shoot downward. The goal is to keep the circle green, in the middle of the meter and spinning joyously. Speaking of brakes, the Chevy Volt's are quite touchy, though not as grippy as the Prius's, which clamp down like vice grips if you breath on them. The nifty thing about the Volt's braking system is that it's an electro-hydraulic power system with regenerative properties on the front brakes. Yes, every time you use the brakes, you are putting power back into the battery. But that's not the only way to brake on a Volt. 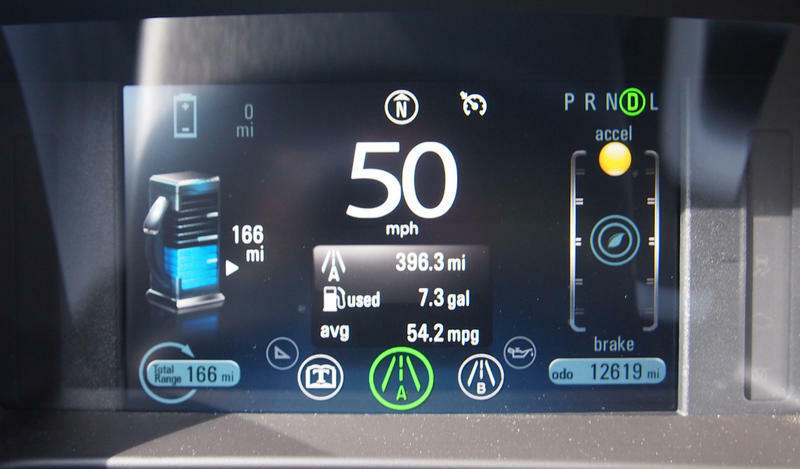 Similar to "B" mode on the Prius, the Chevy Volt has an "L" (Low Gear) mode that can easily be shifted into. In "L" mode, the Volt will engine brake—and much more efficiently than the Prius, I might add. It's such an addictive style of driving that people will pull up and ask if the brake lights are out. Ever since Jon and I saw a Volt in person at the GM facilities, we've both agreed that it's one hot car. Rather than opt for the perky, oblong lines of the Toyota Prius or clown car rear end of the Nissan Leaf, Chevy designed the Volt to fall closer in line with its Cruze sedan. While the sportier design also aided handling, it allowed the Volt to transcend the archetypal image of the goofy eco-vehicle and run with the big guns of the petrol-drinking world. The 17-inch polished aluminum rims were dazzling in the sunlight, and the car's black roof brought a rally car element to its overall presentation. Chrome trim along the doors added the right dosage of swank while not overpowering the aesthetic authority of the car's pronounced lines. 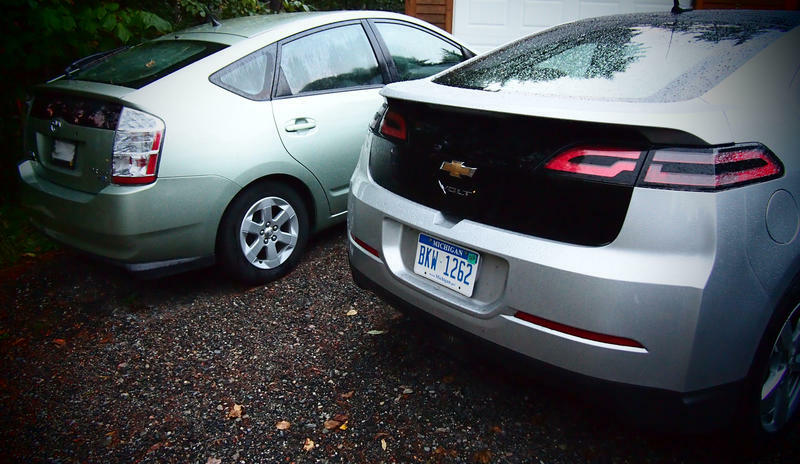 The Chevy Volt is the sexiest EV in production—next to the Tesla Roadster in Lightning Green, of course. On the inside, the Volt was short staffed in the trunk department, though. The back seats were moderately roomy, however, but if you plan on tossing your life in the trunk, the Volt is not the car to offer the space. Also, blind spots are obscured by the Volt's narrow rear windows and ample cross beams. I had to look twice in order to switch lanes. And while we're on the Complain Train, the locomotive was by far the Volt's dash. It's intimidating. 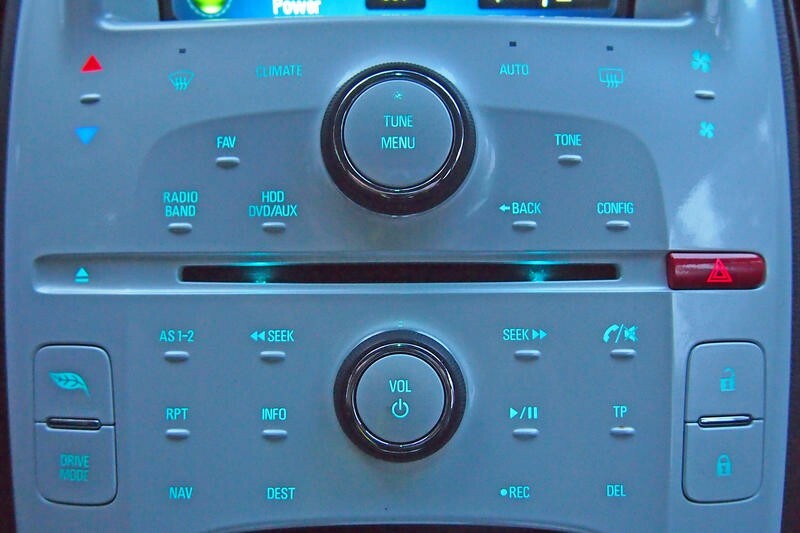 Not only does the giant dash consist of a smorgasbord of touch-sensitive buttons placed within close proximity of one another, but the user interface is not particularly intuitive. I actually had to pull over in order to figure out how to play the XM radio and program a route on the Navigation system at the same time. 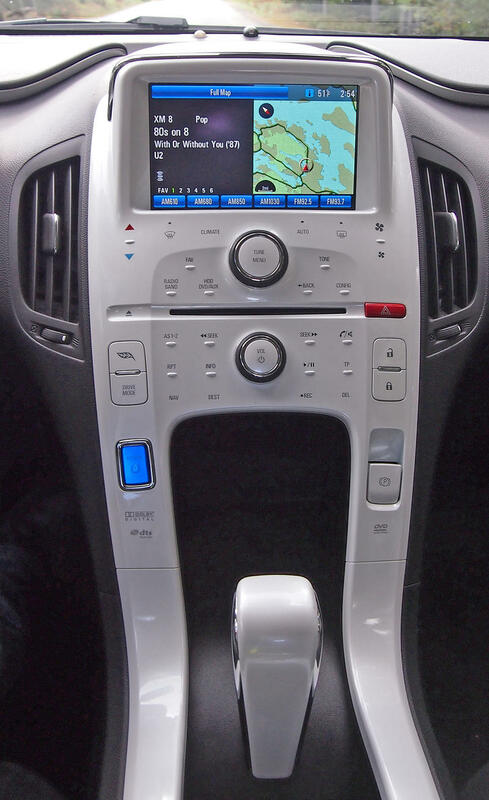 In the end, I just called Onstar, but gradually I was able to adapt to the Volt's demanding dash. I also preferred the Prius's method of driver efficiency mapping over the Volt's. The Prius's LCD screen displays your MPG on a bar graph in five-minute increments. It also has a real-time MPG meter from 0 to 100. This is an exceedingly easy way to graph efficiency. The Volt did not have anything in real-time outside of the acceleration meter. There was an overall MPG average for current and lifetime usage, but it wasn't nearly as fun to follow as that MPG bar graph. Furthermore, the Navigation system did not have a speedometer or speed limit signs, which made me extra paranoid driving past police cruisers in unknown locations. These are minor gripes, compared to the Volt's overall performance and design, but I needed something to nitpick about. 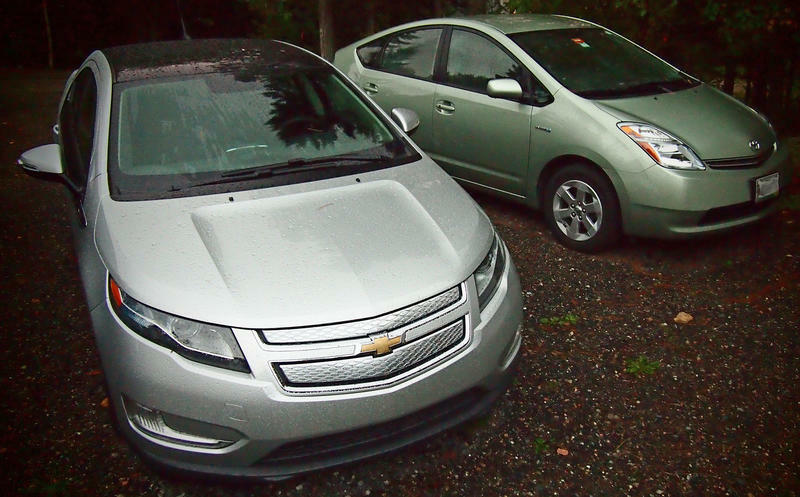 I took the Volt to the Seal Cove Auto Museum in Maine to meet my good friends Jim and Betty. 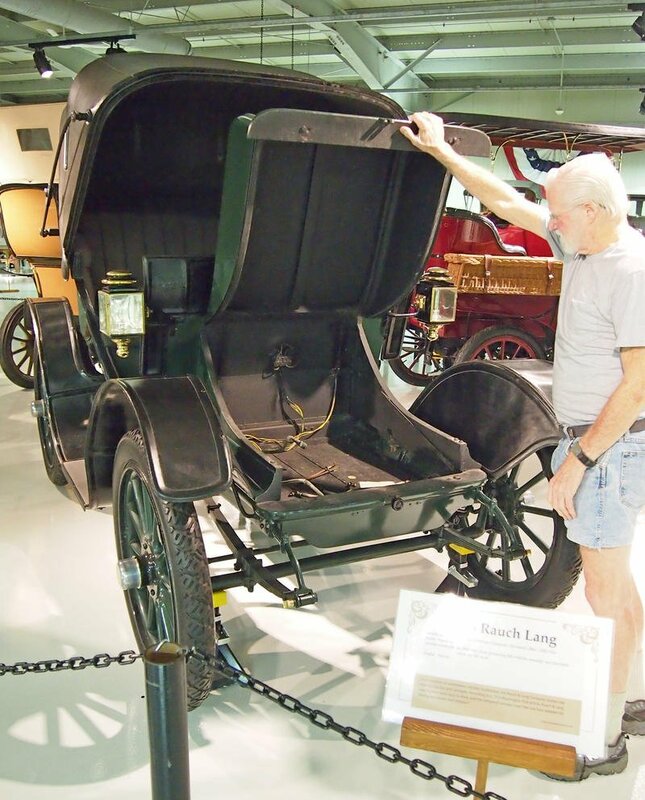 Jim works on early 20th century vehicular dinosaurs of the steam and combustion ilk for the museum, but he showed me a 1908 Rauch and Lang electric car. It had two giant storage compartments for batteries, which were most likely lead-based anvils that offered a highly limited mile range. 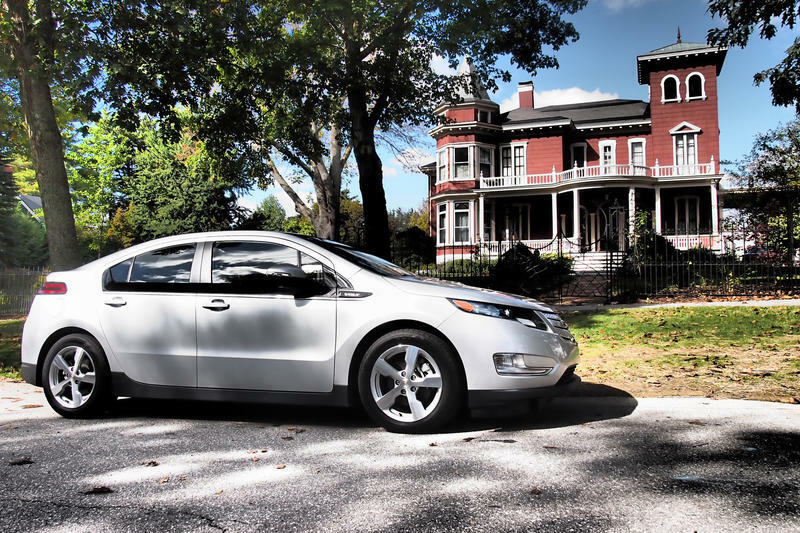 103 years later, we have the Chevy Volt. As I plugged into the museum's electric car charging station, I thought about where the alternatives to crude oil had vanished over the years and why it took decades to resurrect the technology. Oil used to be dirt cheap. Mr. Ford made highly affordable cars. Our supply was seemingly endless. But at some point in this timeline, there will not be any oil to speak of. Stegosaurus remains can only last for so long. We got sidetracked. And now it's time to travel back to the drawing boards and innovate. And that's exactly what GM is doing here. 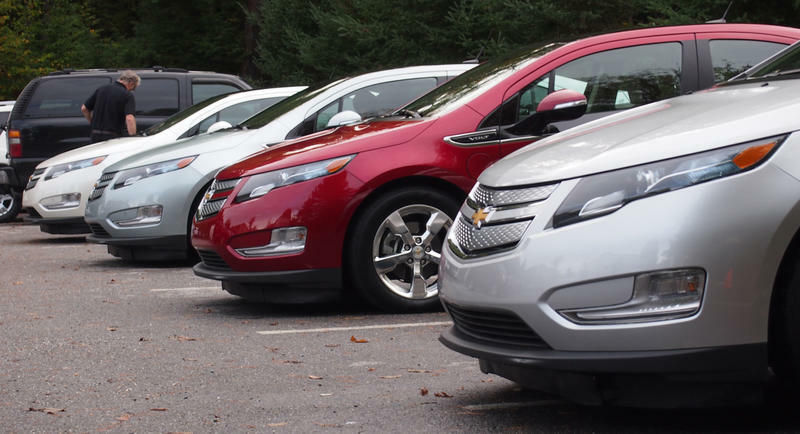 The Chevy Volt may not appeal to every driver on the road. In fact, I see the car as a stellar vehicle for a very specific genre of drivers. But it's a start. Those who are looking outside the pump with reasonable daily commutes to work are ideal candidates for this car. The security of the gas engine is invaluable, preventing range anxiety and allowing EV operators to sleep soundly at night. The Nissan Leaf is too much of a gamble at this stage in the game. The Toyota Prius is a fantastic car, but it's still a bonefide hybrid and requires regular visits to the pump. All-electric Teslas are pretty and offer the best range (about 130 miles per charge on the base Model S) but they start at $50,000 after the full tax credit. In time, battery technology will improve and future generations of Chevy Volts will offer extended ranges. Perhaps someday charging stations will replace gas stations. But if you fit the criteria of a potential Volt owner and your MPC (miles per charge) math looks promising, there is no need to doubt the performance aspect of this car. It handles beautifully, outputs oodles of torque and exhibits one of the highest safety ratings in the market. 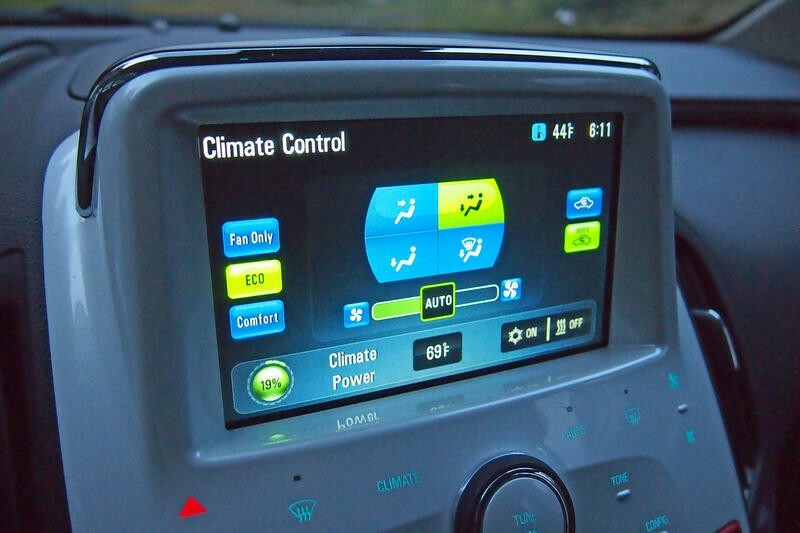 Yes, the Volt is expensive, but the $7,500 tax credit softens the blow. 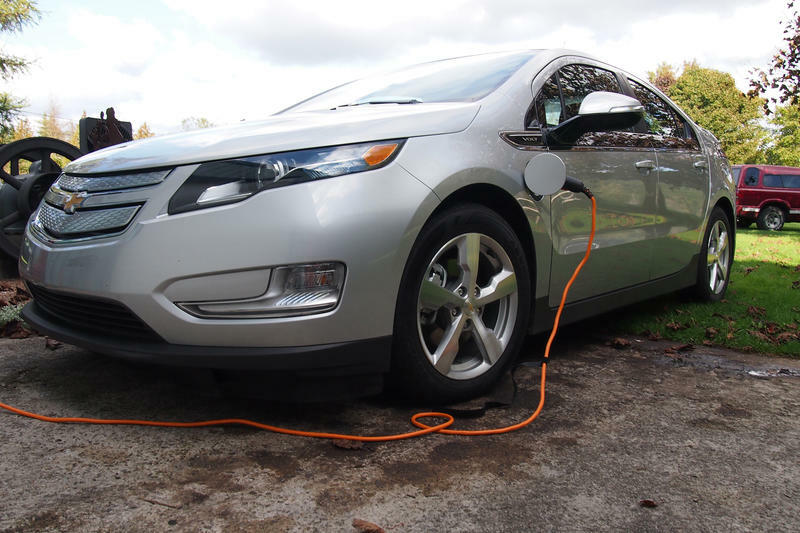 If I was an ideal candidate, I wouldn't think twice about buying a Volt.